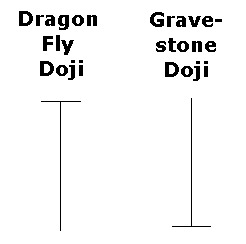 The Doji candlestick is a significant reversal indicator, and are used as a component in other candlestick charting patterns. This candlestick forms when a security's open and close are virtually equal. 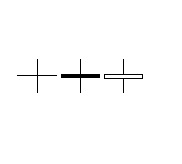 The length of the upper and lower shadows can vary and the resulting candlestick looks like a cross, inverted cross or plus sign. The candlestick-doji are valued for their ability to call market tops. The reason for this is because a-doji represents indecision or uncertainty. And indecision from buyers will not maintain a rally. 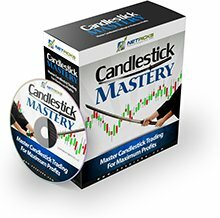 According to Candlesticks guru Steve Nison, they are not as powerful in calling bottoms. 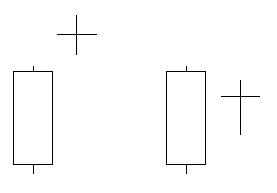 The relevance of a candlestick-doji depends on the preceding trend or preceding candlesticks. After an advance or long white candlestick, a doji signals that buying pressure may be diminishing and the uptrend could be nearing an end. Whereas a security can decline simply from a lack of buyers, continued buying pressure is required to sustain an uptrend. Therefore, a candlestick-doji may be more significant after an uptrend or long white candlestick. Even after the candlestick-doji forms, further downside is required for bearish confirmation. This may come as a gap down, long black candlestick, or decline below the long white candlestick's open. In an uptrend, the market builds strength on a long white day and gaps open on the second day. However, the second day trades within a small range and closes at or near its open. This scenario generally shows an erosion of confidence in the current trend. Confirmation of the trend reversal is the black third day. In a downtrend, the market bolsters the bearish trend with a long black day and gaps open on the second day. However, the second day trades within a small range and closes at or near its open. This scenario generally shows the potential for a rally, as many positions have been changed. Confirmation of the trend reversal is given by the white third day. The general concept of the-doji is that one should look at what happened before the signal. For example, a-doji in an uptrend is a potential reversal, therefore there needs to be an uptrend to reverse. This means that candlestick-doji have little forecasting implications if they are in a sideways or trading environment, since there is no trend to reverse. And keep in mind, the-doji by itself, is NOT a guaranteed reversal signal, only a warning sign as it represents indecision by stock traders. Return from "Doji-Candlestick" to the Home Page: "Stock Market For Beginners"